Pam, meet James. James, this is Pam. 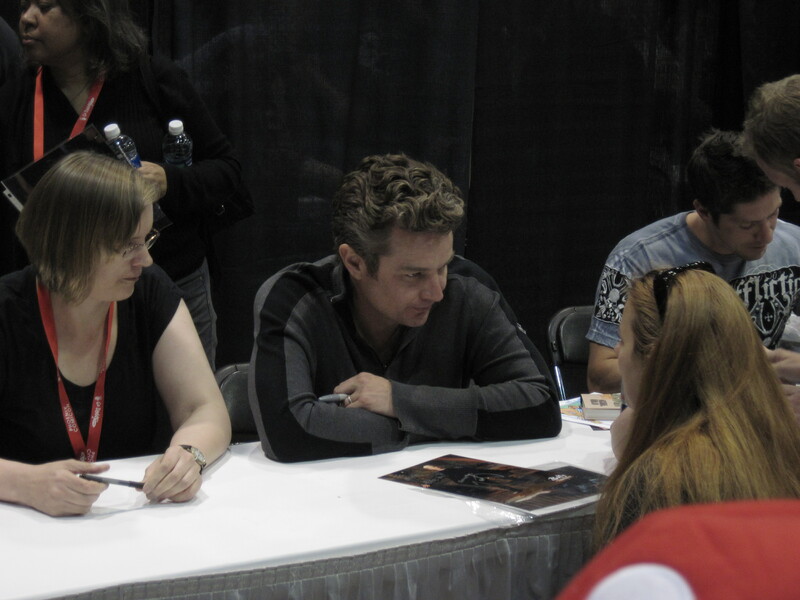 So, as I tweeted with great excitement and awe a few weeks ago, I got to meet James Marsters. 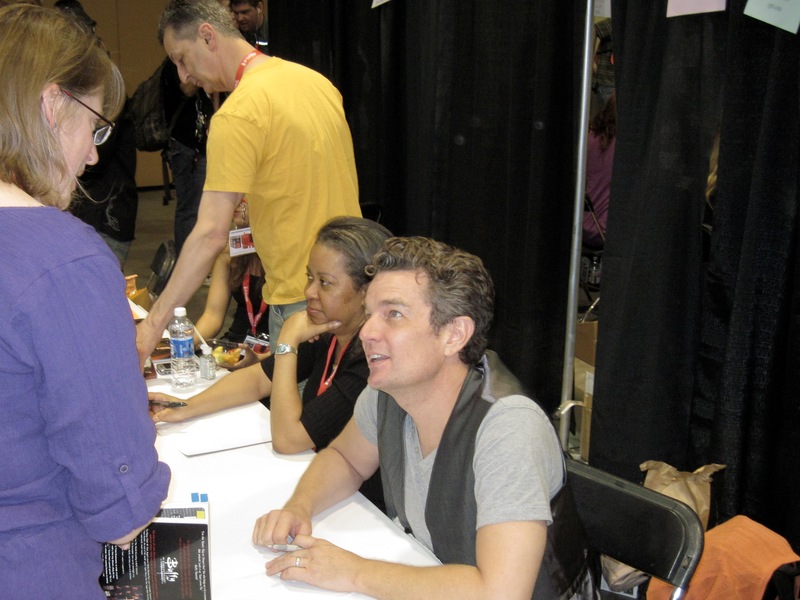 Yes, that James Marsters. Spike. (Or as I’ve always called him, Spikey.) Gather round boys and girls, while I tell you the story of how this happened. It all started months ago when I heard he was going to be at a convention Montana and I had been talking about going to, and once I heard Spikey was confirmed to be there, we signed up. Later, it was announced that Emma Caulfield (Anya) and Felicia Day (potential slayer Vi in season 7) were going to be there as well, so I got my Buffy on and we headed out. Friday I did a walk-by of his table and saw him. Yes, it was a moment. Unfortunately (or however you want to look at it), they had some tight security and line monitors, and…well…it’s true. Absolute power corrupts absolutely. Especially at a sci-fi convention with James Marsters in your stable. So I got rushed along by the line monitor swifter than tween girls aiming for Justin Bieber on a photo shoot. So what’s a girl to do? Yup, I grabbed Montana and got in line. Not more than 10 minutes later I’m next in line to meet Spikey. I remember making a conscious decision to not make eye contact with him until I was standing directly in front of him, but looking back I have no idea why. As much as I’d like to call my probable reason deep or cool or anything else, odds are it was nerves. 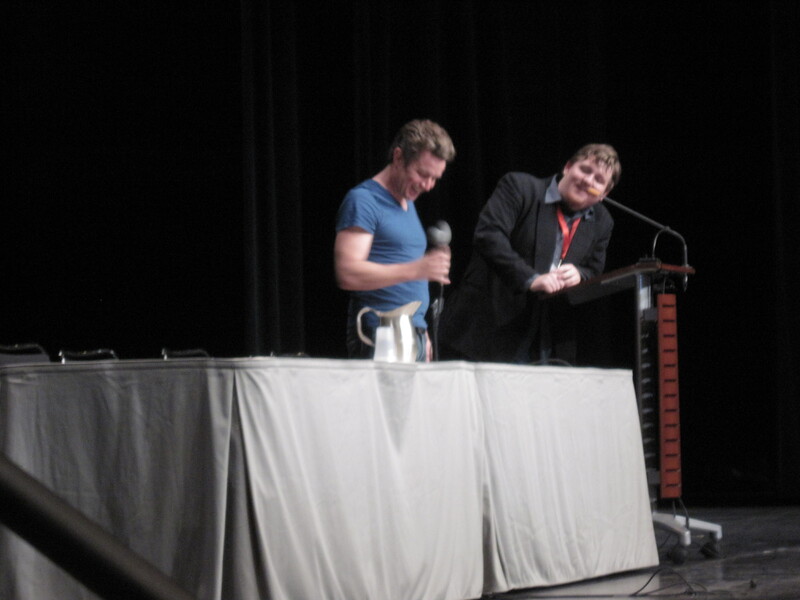 (That or trying to keep FanGirl well and truly quashed so she couldn’t do anything embarrassing. Or illegal.) Anyhoozles, we’re waiting, talking to a few of the people there helping him. The nice people had nice color photos for him to sign if we wanted to purchase them, but not me—I had my Buffy book with a lovely page for him to autograph. Next was the woman who was asking me for my name, and by this time I can see out of the corner of my eye that Spikey is done with the person before me, and looking for the next person in line. I tell the woman, her pen and paper held ready, that my name is Pam. She asks me to spell it (true story—ask Montana) and I obligingly say, “P-A-M.” She doesn’t even write it down, just turns to James and says, “I think you can handle that.” He laughed. Wow. No, let me say that again. Wow. I didn’t know what I had been expecting, except I knew not to expect Spikey, but rather, James. No British accent, no bleached blond hair, no Spikey edge, but you know what? I might have to say I’d take James over Spikey. James was so freaking nice I have trouble describing it here. 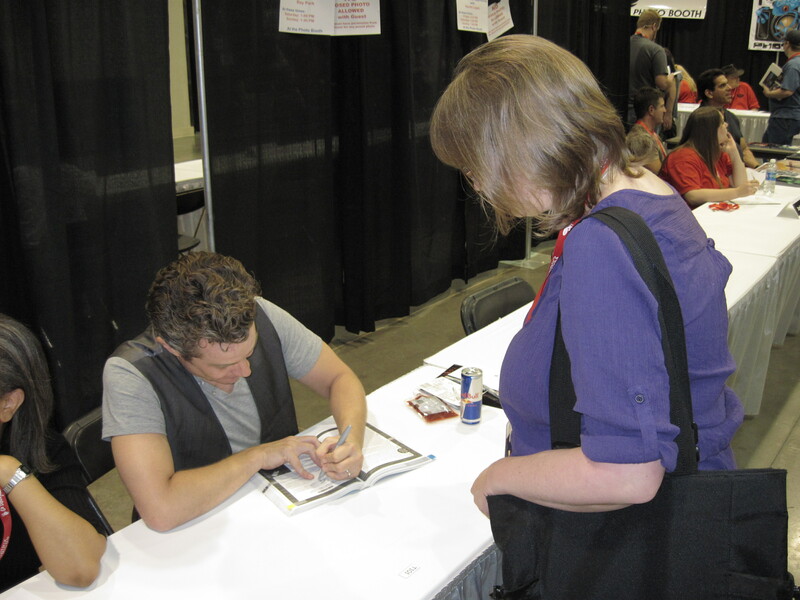 We joked about the crazy spellings of people’s names, he listened as I gushed, er, spoke eloquently of my love for Buffy, not only as an entertaining show, but as a lesson in world-building and arcs and themes, and then told me something I hadn’t heard before—Joss didn’t like Spike. He didn’t write for him. If it were up to Joss, Spikey would have probably been maybe a season-long Big Bad, but nowhere near the force he ends up being. I wasn’t thinking enough to ask who did write for his character, but I thank whatever powers live in the celestial sphere that they did. He shook my hand, he shook Montana’s hand, and away we went. 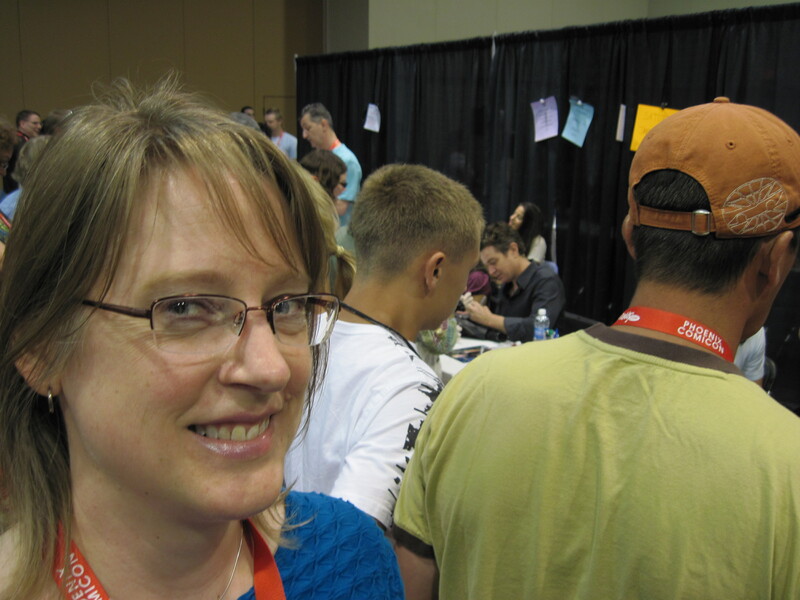 I might have been a little giggly at that point, but I remember thinking just how freaking nice James was. I can call him James now. We’re on a first name basis. See? I haven’t washed my ears since. Brava dear for being coherant during this meeting. Wish I could say when I had a fangirl moment (with someone much less famous btw) I’d been that cool. Nope, blithering idiot I was. Oh and not to mention my latest fangirl-ish moment when I was so excited/nervous I was afraid to open an email. Apparently my ability to be cool in fanish moments peaked when I was oh, about 20. Sigh. It’s so obvious I must watch the Buffy series and then move on to Angel. I’m only on season 1, episode 3. OMG that’s awesome! I was SUPER jealous when I saw you post that before, but the pictures only made it worse…! This is soooo cool, Pamela! I thrilled for you!!! I’m only watching it in the first place because of you and Melina and the rest of the Wiffers. College summer sublet roomie made me watch the movie 30+ times (seemed like the only channel we got) and I avoided Buffy after that. Awesome post, awesome photos! (drink twice) He’s adorable. 🙂 And I’ve definitely re-ignited my teenage crush on Wil Wheaton since I started following him on twitter. Can’t wait to read that post! How cool, Pam!! I love when you meet a celebrity in person and they’re just as nice – or nicer – than you thought they’d be and that makes you love them and their character even more! He looks so different with dark hair though! Thanks for sharing pictures! Who’s next on your list to meet? You guys have some great events in AZ! Oh no Pam! I’m stills signed in as if I were commenting on my students blogs! Whoops!!!!!!!!!! I’m SO sorry about that. Hope I’m not commenting on their blogs as Melina. Wonder what else I’ve screwed up. Melina–yeah, those autofills can be a pain, can’t they? 😉 And I always liked Spikey more than Angel, too, so we’re on the same boat there. And I have to admit to even liking Dru in her own twisted way. Maybe that’s why I write such dark and twisty stories, eh? Glad you had such a great experience meeting Spikey, I mean, James. He sounds very awesome, indeed! !